Anjou & the Little Pear will be heading into 2019 with a Fresh start. Fresh for 2019. Stay Tuned! First…Please take photos of any oversized item rather than bringing them in. We can discuss salability & price. You are welcome to drop off your photo or send it to us by email. Pick-up and delivery – we are happy to help when we can and regret that it cannot always be a free service. Anjou & the Litte Pear accepts higher quality furniture and accessories to consign. Your consignment should include only items that need no repair or cleaning; we welcome seasonal items at the appropriate time of year. Please no plastic. Anjou & the Little Pear takes 40% of the sale price of your items. That leaves you 60%, a much higher percentage than many other consignment deals. We offer a better consignment percentage if you choose credit for Anjou & the Little Pear. Credit can be used in store for 70% of sale, rather than 60% . Anjou & the Little Pear pays any credit card fees which might accrue from consignment sales and pays city and state taxes. The minimum commission is $10.00. Please come to the store to pick up your consignment checks. They will be written twice monthly. Your items are priced after you sign the consignment agreement. We welcome your suggested sale price. The established price will not change for 30 days. On day 31, at the sole discretion of Anjou & the Little Pear, the price will be reduced by 10%. On day 61, the item will be further reduced by 10%. If you do not wish to have your item reduced, please understand it is your responsibility to pick up your item after 30 days. Donating your item is always a GREAT idea and much appreciated. If you choose this option, we feature a worthy local organization to which we will send your portion of the sale as a donation. The Non-profit organization will provide you with a tax receipt directly. Anjou & the Little Pear welcomes your creative consignment ideas! 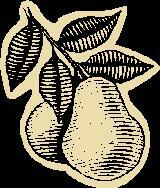 Thank you for considering Anjou & the Little Pear as your consignment outlet.